Deriving prosodic structures is devoted to explicating and exploring prosodic structure formation in relation to syntax. To achieve this, it compares and contrasts empirically attested prosodic constituency patterns of a number of syntactically diverse structures. By investigating parts of words, words, mono- and multi-worded phrases, root clauses, parentheticals, and structures employed as speech acts, this book presents a stepwise analysis of the procedure of mapping from syntax to prosody. It also provides an extended discussion of which syntactic structures correspond to which prosodic structures. Following the basic assumptions of Distributed Morphology and Match Theory, this book claims that only certain heads and projections of narrow syntactic structures (those with a phonological exponent) are mirrored in the prosodic constituency. It also argues that certain prosodic interface categories (e.g. prosodic words and certain intonational phrases) are not generated as the result of mapping from syntax. Rather, they emerge from conditions on prosodic well-formedness. To account for such cases of ‘mismatch’, a limited ‘indirect access’ account is endorsed, in which prosodic constituency is partially faithful to syntax, and the constituency is simplified as a consequence of applying the rules of the prosodic grammar, which is partly universal and partly language-specific. 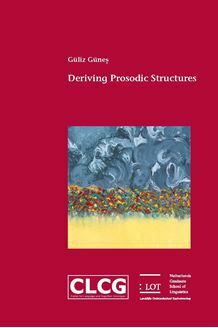 Deriving prosodic structures is of interest to scholars working on the interfaces of syntax, morphology and prosody. It covers topics such as prosodic word formation, acoustic differences between phonological phrases and intonational phrases, the generation of prosodic (non)prominence, prosodic recursion and its absence, phonologically null morphemes and how they are represented in phonology, illocutionary force bearing structures, discourse level embedding of clauses, and the acoustic realisation and the syntactic behaviour of parenthetical structures. Copyright © 2019 LOT Publications. All rights reserved.